1. What was the problem foreseen by Hadrian? Hadrian thought that the empire would be unable to maintain its borders. 2. What problems were the soldiers facing in the Northern part of Britain? The Roman soldiers confronted the dual tracks of freezing winters and Barbarian incursion. 3. What was Hadrian’s conclusion after visiting the front line? He quickly concluded that was necessary to tame the soldiers first. Today Hadrian’s wall has been reduced to its foundations. …forcing the potential invaders to 30 FEET climb. 5. What was the main problem during the construction of the wall, from an engineering point of view? The difficulties to get the materials to build the wall. 6. How many men were needed to move heavy rocks to the construction site? Between 15 and 25 thousand men. 7. What was the purpose of the mile castles? 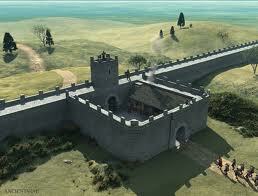 The mile castles were guard post able to house 60 troops. 8. What buildings were found in each superfort? 9. How long did it take to complete Hadrian’s barrier?